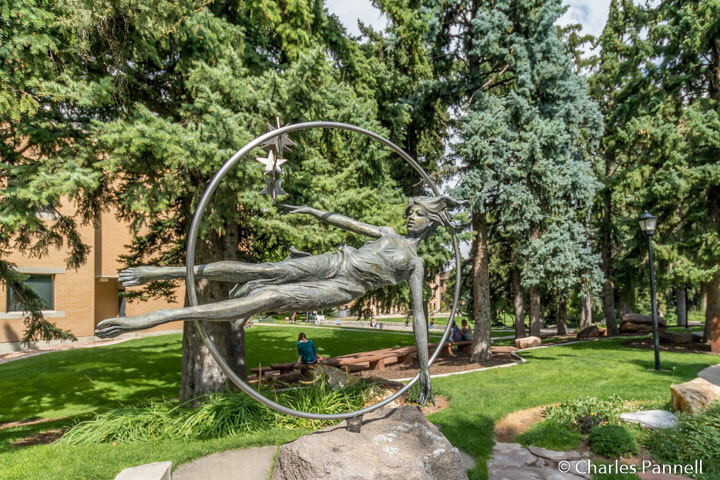 Unbeknownst to many people, Southern Utah University has an impressive collection of sculptures strategically placed throughout the campus. And although you may think this may only be of interest to students, think again. Because of the proximity of the college to the Utah Shakespeare Festival venues, it just makes sense for festival patrons to stretch their legs a bit and take in some of this fine public art. Add in a great on-campus exhibition about the performance of Shakespeare’s plays in California gold rush boomtowns, and you have yet another reason to venture beyond the confines of the theaters on your next Cedar City visit. The best place to begin your sculpture walk is at the Engelstad Shakespeare Theater, located on Shakespeare Lane, right across from the Randall L. Jones Theater. One of the most beloved sculptures in the city sits right up the ramp inside the west theater gate – The Bard himself sitting on a bench. And there’s just enough room to take a seat beside him for the ultimate festival selfie. There’s also barrier-free access to the new Shakespeare Garden, located between the Engelstad and Jones theaters. 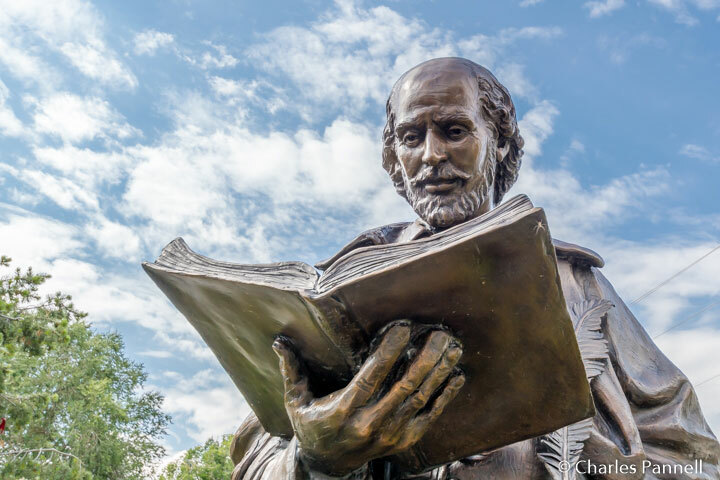 Here you’ll find Shakespeare along with some of his most beloved characters, including Juliet, King Lear and Falstaff, with some of their most memorable quotes engraved on their pedestals. There are also several benches to stop and take a break along the way in the garden, which is a huge plus for slow walkers. Save some time to explore the east entrance to the theater too, where you will find a equally impressive sculpture of Fred Adams, the founder of the Utah Shakespeare Festival. The sculpture stroll continues across S 300 W Street on the campus proper. Follow the level paved sidewalk past the auditorium and head south towards the General Classroom Building. Here you’ll find The Star Maker tucked away between the General Classroom Building and the Science Center. Crafted by Nolan Johnson in 1994, this metal and stone creation is a campus favorite; and as an added bonus, it’s situated in an equally photogenic site. Last but not least, don’t miss The Pioneer Monument, just up the walkway between the Music Building and New South Hall. 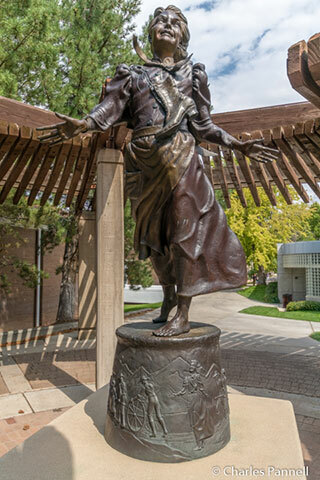 Nicknamed “Nellie” this bronze sculpture depicts the story of Nellie Pucell Unthnak, a young girl who endured numerous hardships to come west and settle in Cedar City. Sculpted by Jerry Anderson in 1991, this piece can also be seen from 200 South Street, but it’s best to stop in for an up-close-and-personal look at this beauty. While you’re on campus, be sure and pop into the Gerald R. Sherratt Library, for a look at the excellent Willy the Kid exhibition in the lower level. There’s level access to the library, with elevator access to all floors, and plenty of room to maneuver a wheelchair through the downstairs exhibition space. This popular exhibition runs through October and features exhibits and information on Shakespeare performances in the American West boomtowns, from 1850 to 1870. Exhibits includes details about some of the historic theaters that hosted traveling Shakespearian troupes during the California Gold Rush. And although the larger cities like Sacramento, San Francisco and Nevada City had traditional theaters, the mining camps featured performances in tents with whatever local musicians they could round-up. At times it lead to some very entertaining performances. And then there was the time when a fire broke out in Placerville during a performance, and the actors left the stage to fight the blaze in full costume. It was definitely the talk of the town — and it made headlines in the local newspaper the next morning. The exhibit also covers the content of the plays which were sometimes adapted for the west. For example there was David Garrick’s adaptation of Romeo and Juliet, where Juliet awakens and exchanges a heartfelt dialogue with Romeo before he dies. This version — as opposed to the original version where the star-crossed lovers don’t get any final words with one other — was a huge hit out west. All in all Willy the Kid is a great exhibition, with lots of tid-bits about the actors, performances and plays. Top it off with a display of old prompt books of the Merchant of Venice, Macbeth and Richard III, and you have a very comprehensive look at Shakespeare in the old west. Truly it’s the perfect compliment to the plays, workshops and seminars available at the Utah Shakespeare Festival.